Killer Oddjob impression Nina Jr! What a Random Task that was. It’s Spirit’s jaunty military-style hat. And his pants probably did fall down, but since this is a family-friendly strip, they wisely kept it off-panel. P.S., I am disappoint that the YouTube video explaining the joke was added. “Look it up” means LOOK IT UP YOURSELF. I just figured that people were going to be lazy. At the very least, a link to the video inside a block of text, rather than an embedded video, would be less detracting. how does a narwhal run? It looks weird that his tie wasn’t cut or damaged, especially since it sticks out further than the suspenders. I would wonder how the shirt didn’t get cut or scratched, but it was established that it is a very nice shirt. Maybe it’s a Teflon Tie. Second panel: Otto (in the background) looks adorable! Yay! The Fuzzy Five-O is complete! Together, they are invincible. 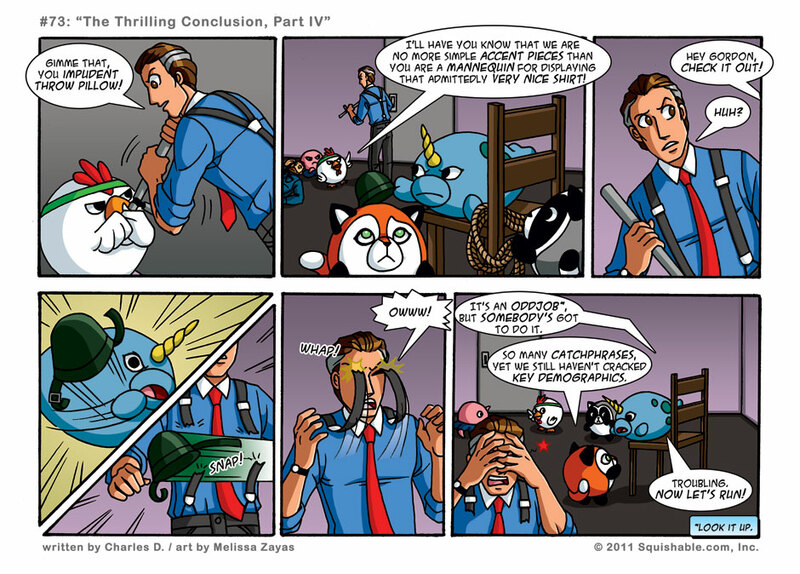 And, does the ‘Thrilling Conclusion’ part mean the end of the Fuzzy Five comics?